Joseph Rudyard Kipling, author of the poem If and the Jungle Books amongst many others, was born in 1865 in Bombay but returned to England as a young child. The 1881 census finds him aged 15 years at school in Devon but as he didn't prove academic enough for a scholarship to Oxford he took on the job of assistant editor of a local newspaper in Lahore, Punjab (now Pakistan). He was soon writing stories for the newspaper and when he left in 1889 it was to return to London where he wrote his first novel. By 1892 he was married to Carrie Balestier, an American (the bride was given away by Henry James) and the couple moved to Vermont where they intended to remain, but anti British feeling (due to political issues) and problems with Carrie's brother (as a result of his drinking problem) ruined their time there so they packed their bags and along with their two children returned to England. Although they initially moved to Devon they soon found themselves living in Rottingdean in East Sussex but Kiplings fame had grown and they soon found the house was too accessible to gawpers and too full of memories of their eldest daughter who died in 1899. In 1902 they bought a house in Burwash which "we have loved it ever since our first sight of it" Batemans, as the house was called, had been built in 1634 for a Wealden ironmaster and at the time Kipling purchased it, it was run down with no bathroom, no running water upstairs and no electricity. The Kiplings remained at Batemans and they created a beautiful home. Kipling was very keen on technology and soon had a car beginning with a steam powered car before he acquired a Rolls Royce in 1911. Within weeks of his arrival at Batemans he had altered the mill so that instead of grinding corn it drove a generator and provided electricity to the house (three hours worth of running the generator created enough electricity to power the lights for four hours an evening). Kiplings life at Batemans was torn apart by the First World War; they had already lost their eldest daughter, now their only son John died just weeks after arriving in France - he was just 18 years old. In addition to their grief Kipling had the guilt that he had used his connections to get John a commission when he had already been twice turned down due to his poor eyesight. John Kiplings body was not identified in Kiplings life time and this may in part be the reason Kipling became involved with the Imperial War Graves Commission (now the Commonwealth War Graves Commission). He advised on inscriptions and is responsible for the phrase "Their Name Liveth For Evermore" and "Known unto God" used on larger war graves and for unknown soldiers graves respectively. Kipling continued to write but less prolifically and less successfully. He suffered with stomach ulcers and could eat only very simple and plain food. He died of a perforated ucler on the 18th January 1936 whilst in London. His ashes are buried in Poets Corner in Westminster Abbey. 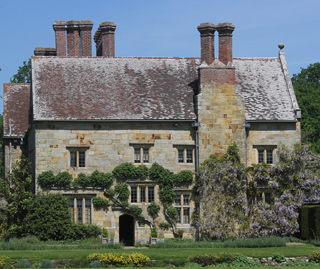 His wife remained at Batemans until her death in 1939 when the property and its 330 acres were given to the National Trust as a memorial to Kipling. The house can been seen today much as it was in Kiplings time.